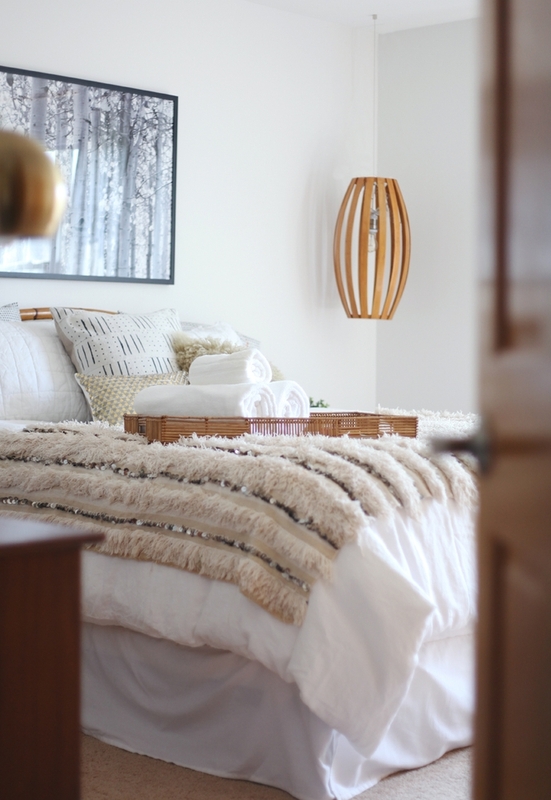 We met Kyla Herbes, the blogger behind House of Hipsters, last year when she started her guest bedroom design project. 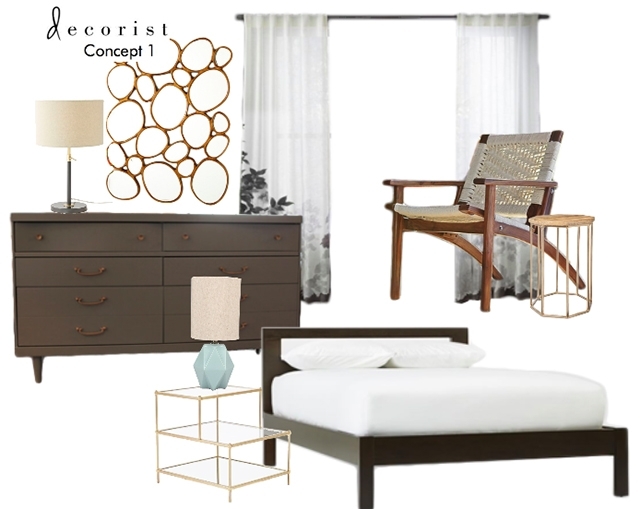 Kyla had heard about Decorist and online interior design and wanted to give it a try. We paired Kyla with Decorist designer Ashley Redmond, who shared her eclectic, whimsical style and passion for flea market and vintage finds. The fun began right away. 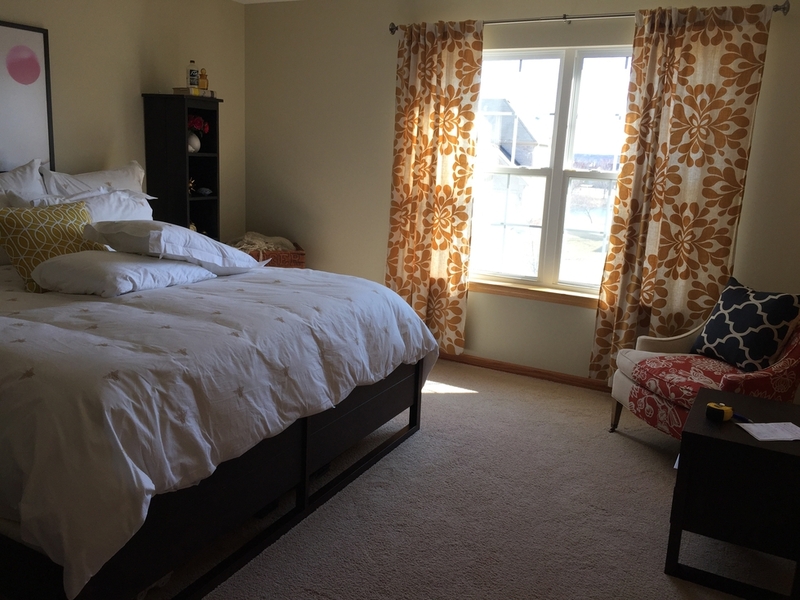 Kyla answered a bunch of questions on her bedroom decor, goals for her bedroom design, color preference, budget, favorite retailers, inspiration and anything she wanted to keep or replace. Kyla is a huge Emily Henderson fan. If you read Kyla’s blog you know she’s a total hoot. She told us she was not trying to spend thousands, but wanted it to look like she spent thousands. Her bedroom had became a home for orphaned furniture. “It’s turned into a hot mess that is quite frankly embarrassing.” Needless to say reading Kyla’s project questionnaire was always entertaining! Here's the before. The first design concept is a light and airy space with hints of brass to create dimension and add a bit of shine. 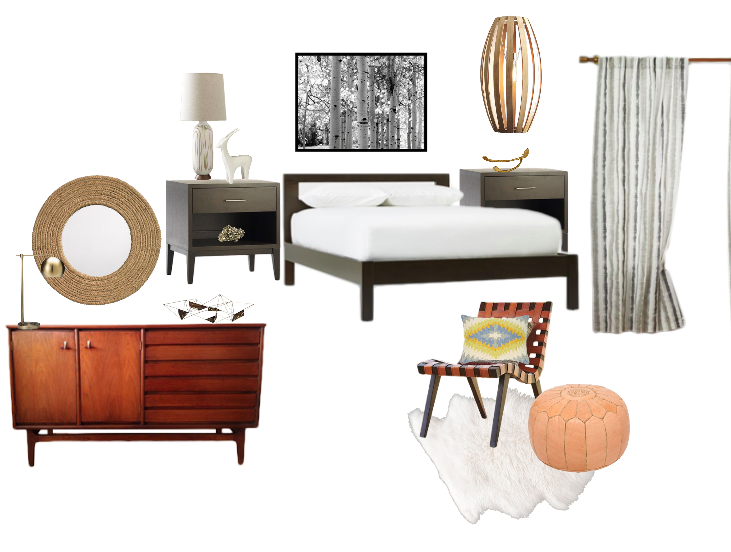 On the second design concept, Ashley went for a more natural, earthy feel with clean lines and a mid-century influence. She kept Kyla’s bed and existing nightstands. 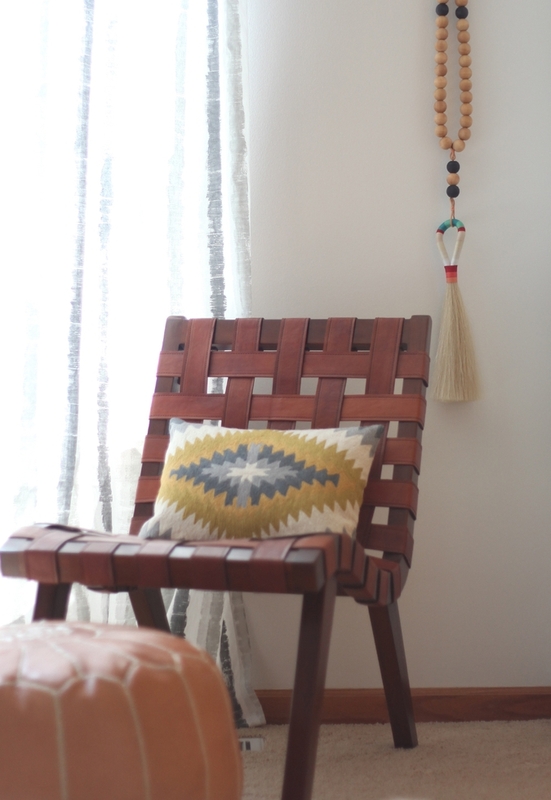 She pulled in more natural materials throughout the design—leathers, jutes and natural woods. Ashley suggested a bentwood pendant in the corner over one of the nightstands to create visual interest and add height to the space. 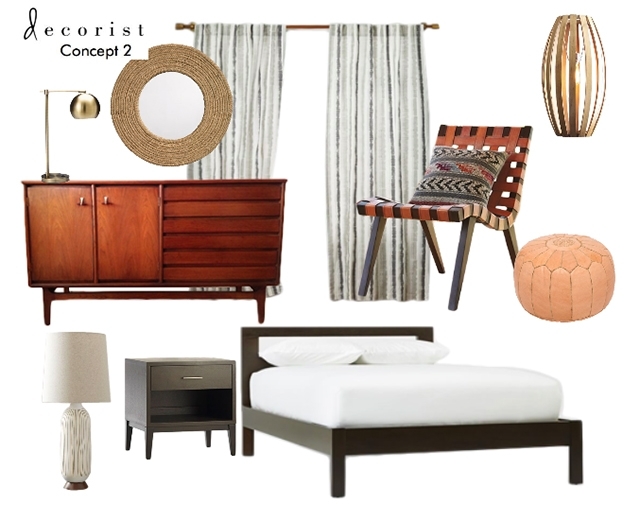 She added contrast to the traditional mid-century dresser by pairing it with a circular woven jute mirror, and added in a woven leather slipper chair and a moroccan pouf to add texture. Drum roll please…here’s the big reveal. In Kyla’s words: “I KNOW RIGHT?! Jaw drop!" The white and the neutrals! It’s glorious with all the texture popping! It keeps your eye moving." Kyla is the queen of flea markets, estate sales and a regular on the Chairish Instagram Sale. The wedding blanket (which probably weighs 10 pounds!) was found there, and it was perfect. 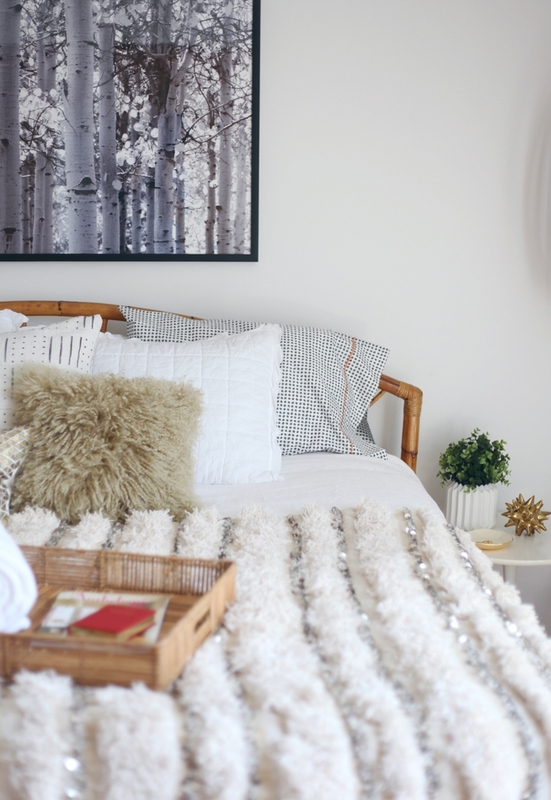 Over the bed is hung a photograph of birch trees which was Kyla's favorite tree growing up. She used to climb it with her sister and was thrilled when she saw it in her final concept design board. The nightstand and headboard in the concept was originally, per Kyla's request, from her old master bedroom set. Ashley worked with it and incorporated the old furniture into the final concept but told Kyla that if she wanted a mid-century modern look, be sure to avoid the matchy-matchy look. So, after a few back and forth emails, Kyla raided her daughter's room for this beauty of a nightstand from West Elm. The mid-century table lamp adds a touch of vintage and subtle texture. 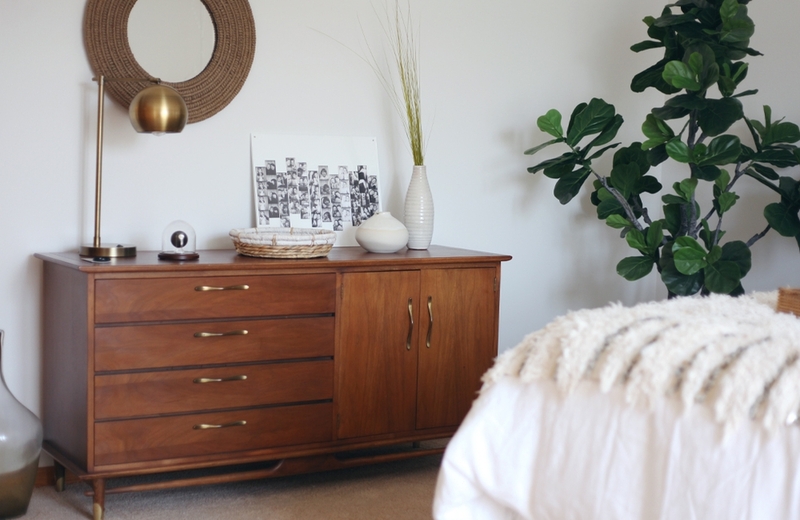 Ashley chose this mid century modern dresser that Kyla snapped off Craigslist from Sharkgravy. The jute mirror adds even more texture to the space, and the brass task lamp gives a metallic pop. 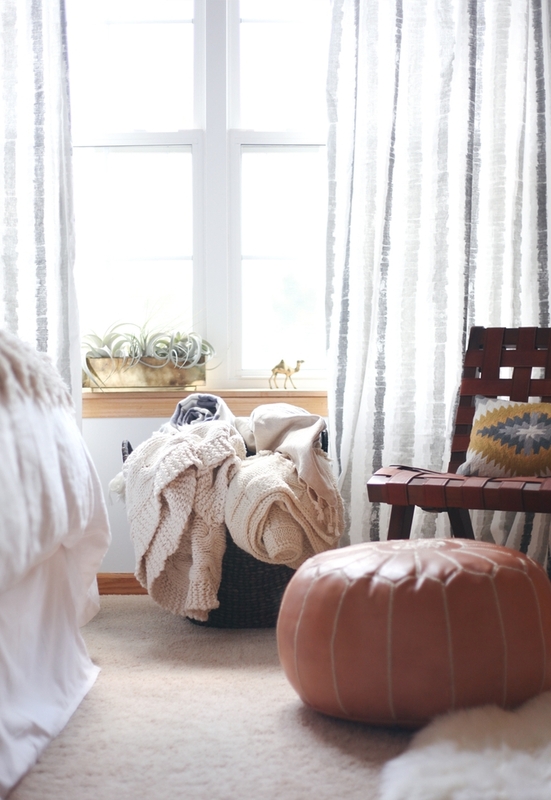 At the foot of the bed is the leather woven slipper chair paired with a leather caramel colored Moroccan pouf. This chair is what sold Kyla on the entire concept. Kyla's words: "The sheep skin rug is seriously the softest thing I’ve touched. I’d be lying if I said I haven’t sat down to pet it. And now my mom will no longer get cold at night. Look at all those throws in the curved basket! 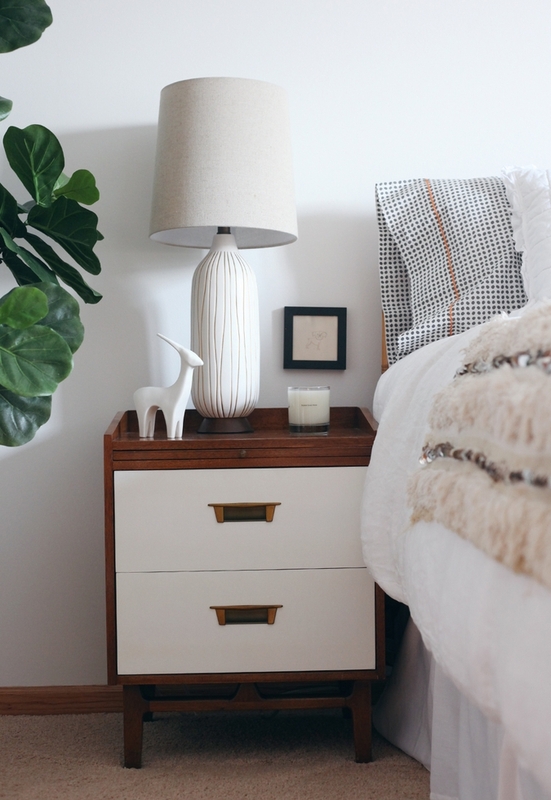 The brass planter filled with air plants is my nod to my sweet thang Emily Henderson." Now Kyla and Ashley are Instagram buddies and BFF’s. “This design project with Decorist was truly a knock it out of the park home run.” In fact Refinery29 featured it last week. Tour Kyla’s home here and be sure to check out her mugshot collection…we told ya she was a hoot! Ready for your own online interior design project? Begin the fun by starting your online design project now.